The common cold is often accompanied by symptoms such as a stuffed-up and runny nose, coughing, sneezing, watery eyes and difficulty breathing, particularly during exercise. Sufferers may also experience a low-grade fever, a sore throat or mild body aches. Swimmers, especially those training for a goal or competition, may feel compelled to swim and finish a workout despite their symptoms. If you do decide to swim, you should pay close attention to the severity of your symptoms, monitor the intensity of the workout and try not to spread germs to teammates or other pool users. Assess your symptoms and watch for any additional symptoms. Opt out of the workout if your chest is congested or you are wheezing. If you're suffering from an upset stomach, body aches or fatigue, put your workout off. Dial back on the intensity of your workout. If your symptoms are above the neck, it's safe to exercise, but consider making your workout easier or shorter, since your body is already working hard to fight the cold. By reducing the intensity or duration of the swim, you're also decreasing the chance of the cold developing into something more serious that could sideline you for much longer. A few days of easy swimming, or not swimming at all, won't have much effect on your overall training. Breathe in the moist air. 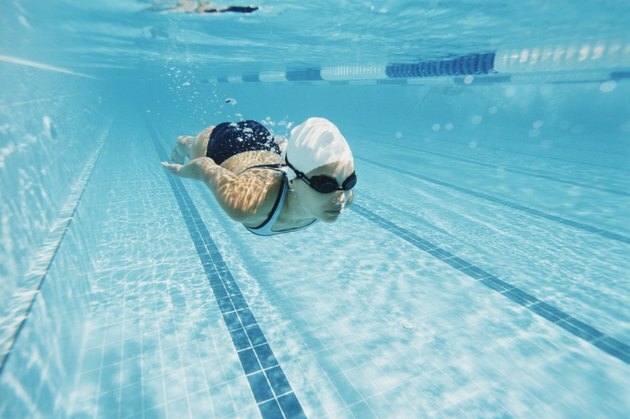 Unlike other exercises, swimming may help alleviate the symptoms of a cold. The moist pool air helps to open up your nasal passages, allowing the mucus to drain and helping to improve breathing. A light swimming workout can also help bring blood to muscles, making you feel a little better. Rule out an allergy. If you only experience the symptoms of a cold when you're at the pool, you may be suffering from an allergic reaction instead of a cold. Pools treated with chlorine or bromine can induce cold-like symptoms, including sneezing, runny nose and a cough, the United States Masters Swimming website reports. If you think you may be reacting to these chemicals, consult an allergist or try taking an antihistamine or wearing a nose clip when you swim. If you suffer from coughing while you swim, try breathing through your nose, rather than your mouth. Keep your germs from spreading. When you decide to swim with a cold, it's your responsibility to take precautions to avoid infecting others. Chlorine doesn't kill germs instantly, so wash your hands frequently, particularly after you sneeze. If you're on a swim team, avoid sharing water bottles or towels. Discuss your workout regimen and health status with your doctor, who can give advice specific to your situation.